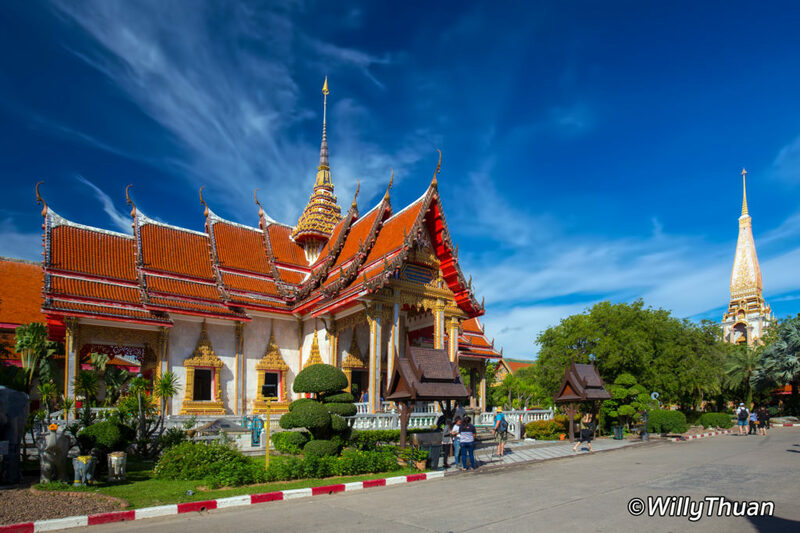 Home Archive by Category "One Day Excursion Recommended"
Wat Chalong, the largest, most revered and most visited Buddhist temple in Phuket was built at the beginning of the 19th century. 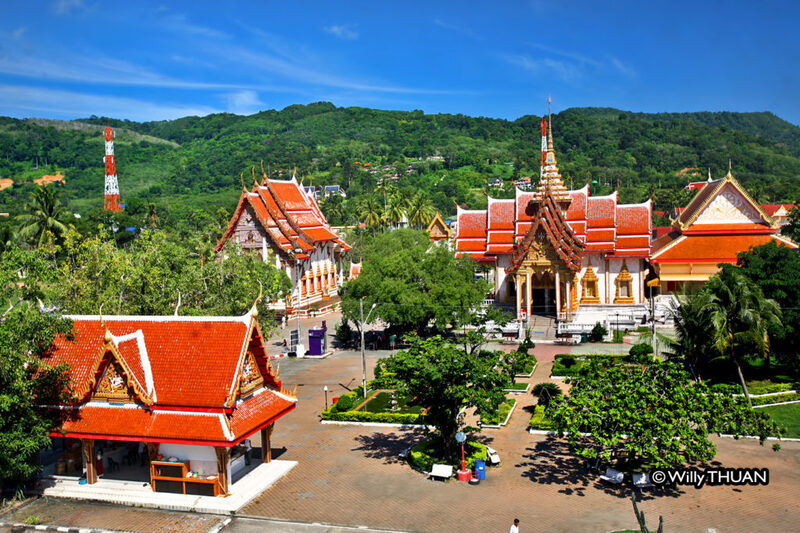 Chalong Temple (officially Wat Chaitararam) is one of the Must-See places in Phuket, together with the nearby Big Buddha of Phuket as they are relatively close to each other. The tallest building on the grounds of Wat Chalong is a 60 meters tall stupa (chedi) sheltering a bone fragment of Lord Buddha. Walls and ceilings of the temple are decorated with beautiful painting retracing the most significant steps of Buddha’s life. Each floor is also full of large donated golden statues. 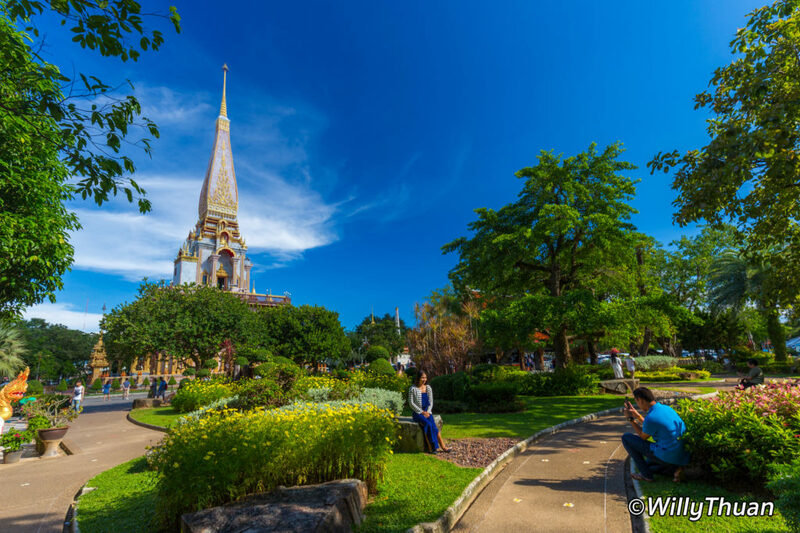 Wat Chalong Chedi is built on three floors so feel free to climb all the way to the top floor terrace to get a beautiful bird view on the entire temple grounds. Few more steps will lead you to a glass display where the fragment of bone can be contemplated. 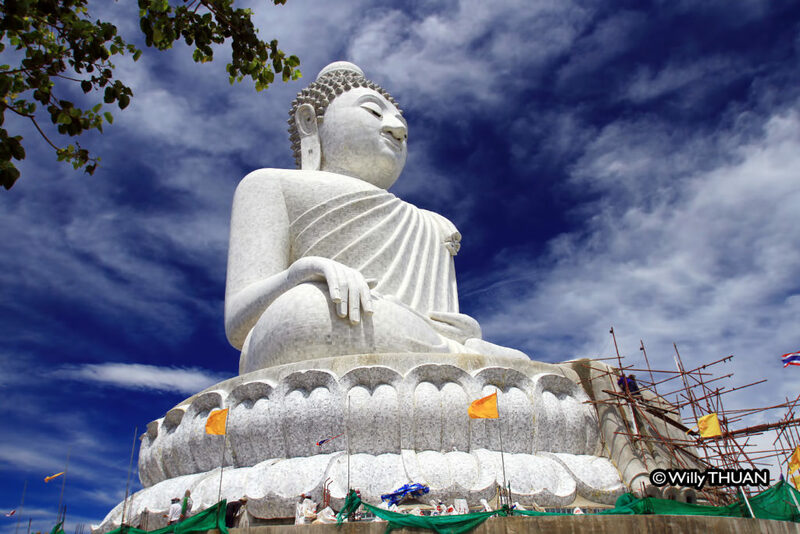 You can see the nearby Phuket Big Buddha from there, but you can see it from almost anywhere in the southern part of Phuket island. 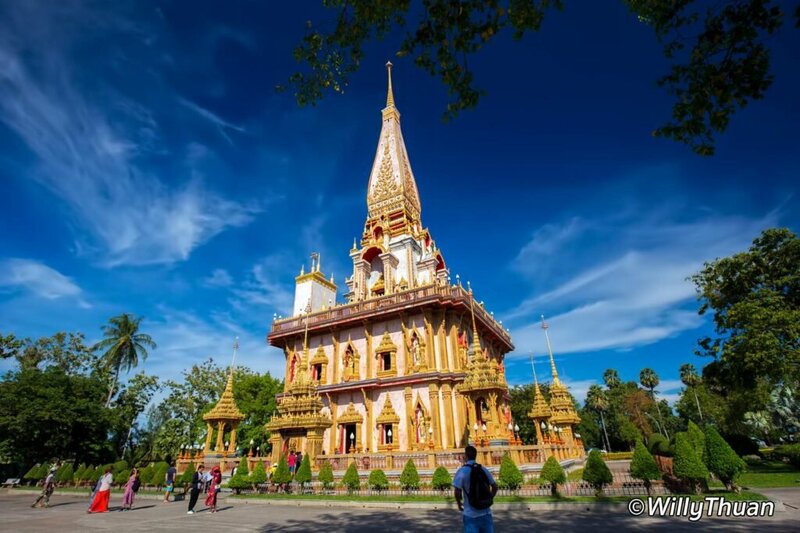 The central temple is where most Thai people will make merit by offering lotus flowers and adding a small piece of gold paper to the monk’s statues inside. 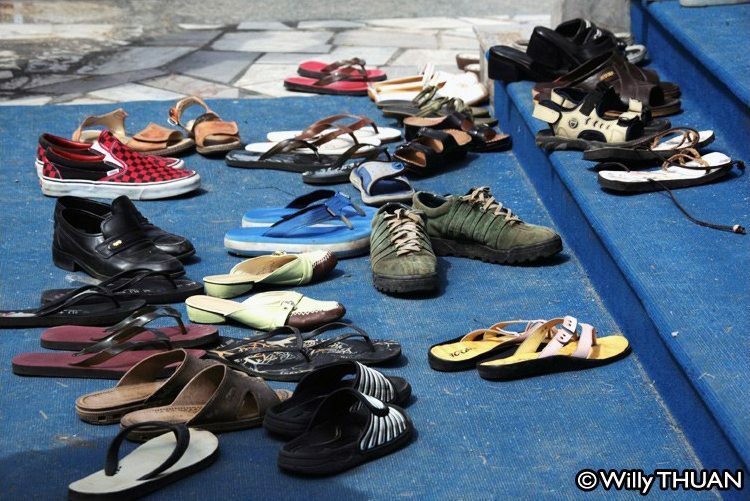 No need to tell you to remove your shoes, you already know that, and the sea of shoes in front of the temple will remind you anyway. In theory, you should wear long pants and no sleeveless shirts, but this requirement seems to belong to a past era. Once in a while, you will hear loud explosions of firecrackers coming from a brick oven-like construction. That’s another way to make merit, supposedly to show your gratitude when one of your wishes came true. One person stands by to lit the firecrackers for you, the big ones are pretty scary but make fun photos (see video). On the side of the temple, a dozen small shops are selling all kinds of souvenirs and tourist stuff. Strangely, the shops selling religious items are outside the temple ground, next to the gate, go figure. Then there are the occasional large funfairs, displaying lots of food, plenty of favourite Thai games and big stage performances. It’s always fun, noisy, entertaining and will undoubtedly give you interesting of opportunities to take some fun photos and insight on Thai life. From Phuket town, take ‘Chaofah Road’ in the direction of Chalong and Rawai. There are two Chaofah Roads: the one you need is passing in front of Central Festival and all the shopping malls. It’s about 10 km from Central on the left, well indicated. 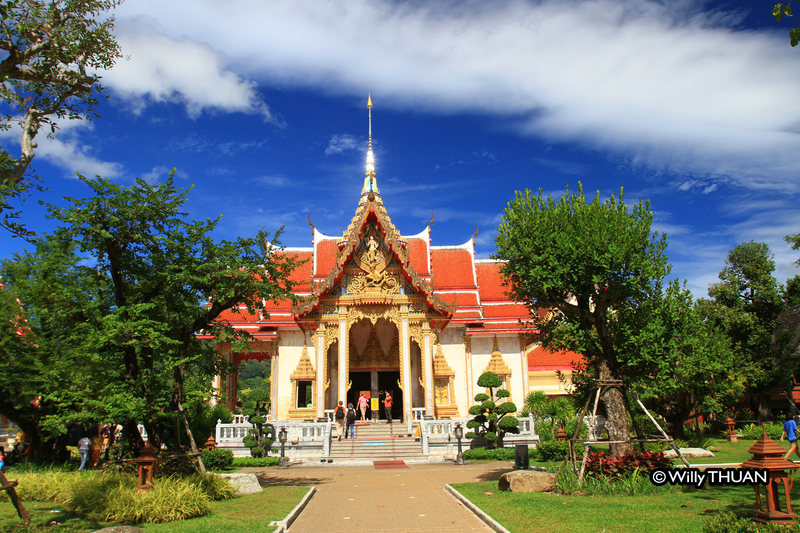 Wat Chalong is a nice stop on the way to the nearest interesting point: the Big Buddha. 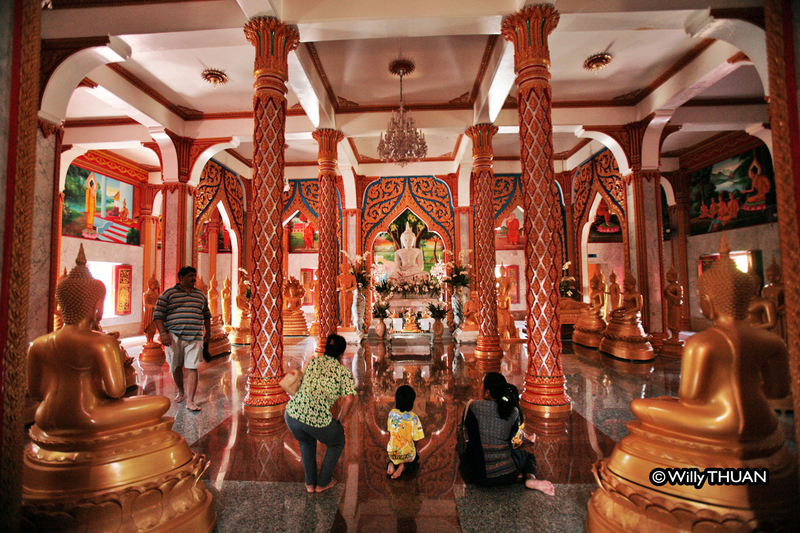 If you like temples, see also the reclining Buddha of Wat Sri Sunthon.